Do you ever look at your calendar or to-do list and wonder how you’ll get everything done? This morning I looked at my schedule for upcoming ministry trips and asked myself how it accommodates for time with our family, my senior mom, our neighbors in the marina, and my writing projects. But as I prayed about it, I sensed the Lord say, “Be still. Let Me take charge of those details.” Then the Holy Spirit brought Psalm 139:16 to mind. I meditated on it for a few minutes, and calm washed over me. 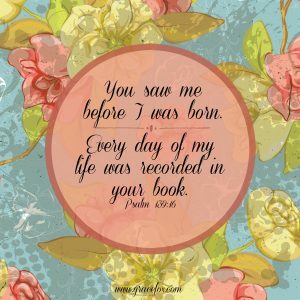 Realizing that God laid out every moment of every day of my life before my birth brings me peace. He knows what my family’s needs will be in the future, and whether I need to be available or He has someone else in mind to help should help be necessary. He also knows how much work any future writing projects might take and what their deadlines will be. It’s my role to trust that He’s carved out enough time for me to meet those deadlines. It’s our responsibility not to overcommit. Not every opportunity or task that comes our way is ours to do. We need only say yes to those that the Lord gives us. It’s our responsibility to keep our heart in tune with God’s. The more intimate our relationship with Him, the more able we are to discern what He wants us to do with our time and energy. It’s our responsibility to follow the Holy Spirit’s lead every day. Sometimes He interrupts our neatly arranged schedule and our best laid plans fall like dominoes. Do we respond with annoyance or do we go with His flow? So long as I make my relationship with Jesus my first priority, I can trust Him to guide me and to help me accomplish all that He wants accomplished. Every day of my life rolls out as He has purposed when He’s my number one. What spiritual truth helps minimize stress when you feel overwhelmed by a busy schedule?